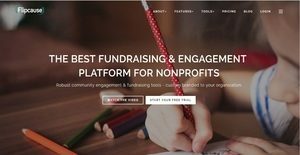 Flipcause combines fundraising solution and community engagement platform to give small nonprofits the tools they’ll ever need to manage events, from volunteers to sponsors to crowdfunding. This all-in-one approach is made possible with apps that come with the system, including a CRM, and payment processing. Flipcause is dedicated to empowering nonprofits to have greater impact with fewer resources. It offers industry-low pricing and every subscription plan comes with a dedicated Success Team and free Concierge Services. Flipcause enables nonprofits to connect with communities through supporting a direct integration with their websites, empowering them to launch fundraising campaigns through the installation of easy to install campaign integration codes that require no technical expertise. Furthermore, it provides users the opportunity to fully host a campaign promoting the brand and cause of their organization. Flipcause also allows users to manage their events, especially the registration aspect, as well as their donations and recurring payments. With Flipcause, you have everything you need to effectively manage your event, for whatever cause it maybe. This also works for those who simply want to dig into their information. You can do these and more from within the platform. Flipcause is designed to relieve you of your fundraising and community engagement burdens. Your Flipcause subscription includes a dedicated Success Team of knowledgeable, friendly people to answer your questions and help you every step of the way. You also have the option to have Flipcause create the fundraising campaigns for you. Flipcause tools work great with your existing website. However, if you’re interested in a new website, Flipcause can build one for you. Flipcause takes existing content from your current website and transfers it to an easy-to-use, modern web builder. The web technicians will be available to make updates to your website when you need them and troubleshoot any issues that may come up. Flipcause offers progressive pricing that fits your budget. And their industry-low guaranteed effective rate of 1.5% means more of the money you raise goes directly to your nonprofit. If you are considering Flipcause it might also be a good idea to examine other subcategories of Best Donor Management Software gathered in our base of SaaS software reviews. It is essential to realize that hardly any software in the Donor Management Software category is going to be a perfect solution that can fulfill all the requirements of all company types, sizes and industries. It may be a good idea to read a few Flipcause reviews first as some services might perform well only in a very small group of applications or be prepared with a really specific type of industry in mind. Others might operate with an intention of being easy and intuitive and consequently lack complex elements welcomed by more experienced users. You can also find services that support a wide group of customers and offer a complex feature toolbox, but that frequently comes at a higher cost of such a software. Ensure you're aware of your requirements so that you get a solution that has all the features you search for. How Much Does Flipcause Cost? We realize that when you make a decision to buy Donor Management Software it’s important not only to see how experts evaluate it in their reviews, but also to find out if the real people and companies that buy it are actually satisfied with the product. That’s why we’ve created our behavior-based Customer Satisfaction Algorithm™ that gathers customer reviews, comments and Flipcause reviews across a wide range of social media sites. The data is then presented in an easy to digest form showing how many people had positive and negative experience with Flipcause. With that information at hand you should be equipped to make an informed buying decision that you won’t regret. What are Flipcause pricing details? What integrations are available for Flipcause? If you need more information about Flipcause or you simply have a question let us know what you need and we’ll forward your request directly to the vendor.